Amidst all of the Dieselgate scandals, it’s great to know that some people aim to reduce future emissions by choosing to drive electric cars. They sure do know how to treat the environment. But we’re not sure they’re giving each other that same kind of lofty treatment—from how people described it to The New York Times, electric-car owning in California is almost like strategic warfare. As California encourages electric vehicles in order to help reduce emissions, numbers of charging outlets don’t exactly stack up with the goals. It’s the classic problem of scarcity (let’s just hope the competition doesn’t get too aggressive)—people need to charge their cars, and other folks are too busy using the outlets for themselves. So what are people doing about it? Unplugging cars. Making deals to swap spots. Insulting each other. No, we’re not joking. We wish we were. From what people tell the Times, there’s quite the problem as far as electric-vehicle etiquette (now of course, we’re not saying all electric-car owners are at each other’s throats about outlets, but we can all get pretty testy when we need power and there are fewer outlets hanging around than we’d like). In the moments after Don Han plugged in his Nissan Leaf at a public charging station near his Silicon Valley office one day this summer, he noticed another Leaf pull up as he was walking away. The driver got out and pulled the charger out of Mr. Han’s car and started to plug it into his own. Mr. Han stormed back. Ouch. People really do get feisty for those chargers. 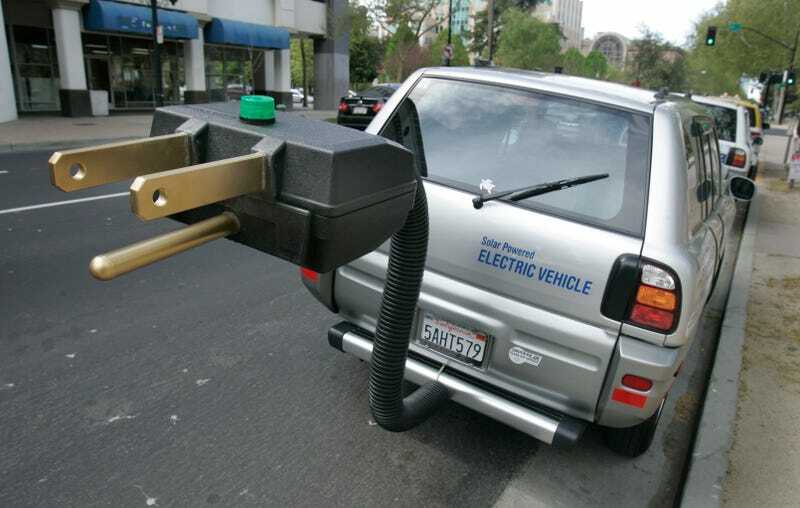 The Times reported that there is currently about one charging station per every 10 cars in existence—about 15,000 total cars in California and 33,000 in the U.S.—and Gov. Jerry Brown promised a whole lot more charging stations as the numbers of electric cars keep going up. Charging stations and cars usually have lights acting as indicators of how charged each car is, so it’s safe to say that the guy above might have been fully aware that Mr. Han’s car wasn’t charged. OK, so maybe the insults these people are throwing aren’t nearly as bad as we originally thought. As far as profanity, we’re not sure “you ICE hole!” would raise too many eyebrows in the parking lot. Still, it’s quite an entertaining thing to envision.